The living room. The Cross House. January 14, 2015. 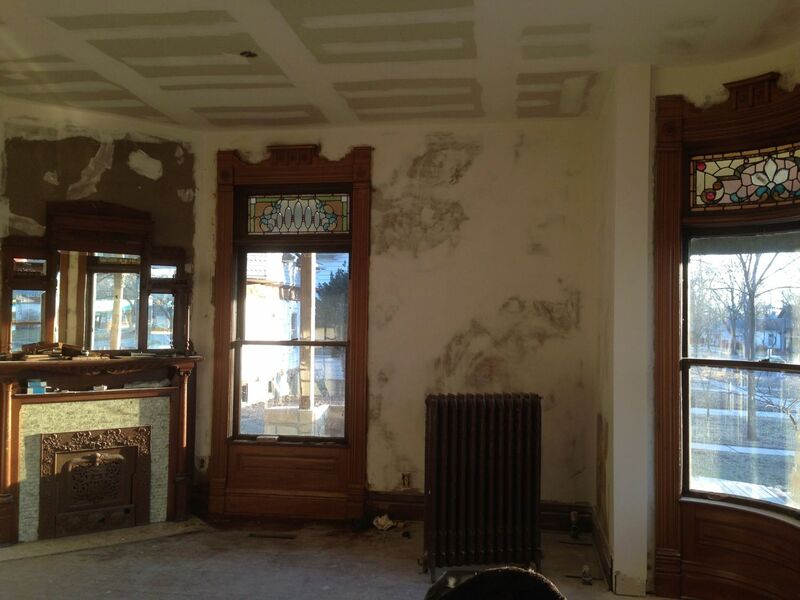 Most of the window trim has been stripped to reveal the original 1894 faux wood finish. I have not yet touched the mantle or over-mantle. The radiator has been temporarily detached. I love love love radiators. Oh, over to the upper right is a now-concealed HUGE steel I-beam which was inserted into the ceiling to hold the house up. The south-facing window. 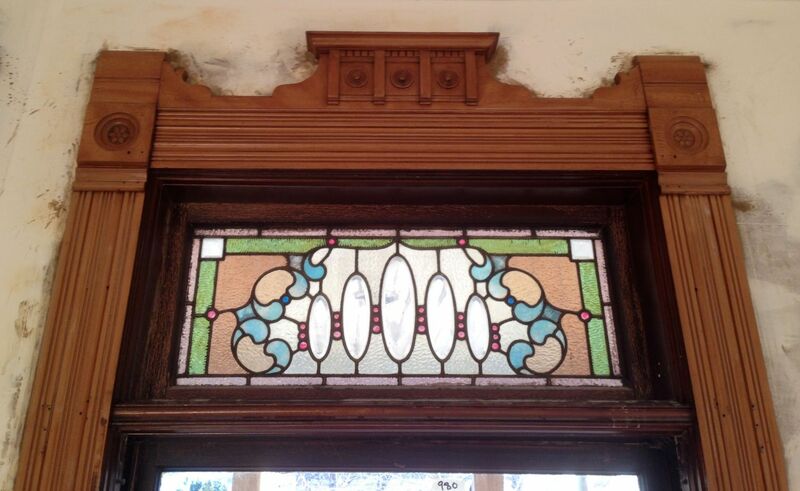 The light-colored trim is the 1894 finish revealed after almost a century of being hidden. Way cool. The dark-colored trim is what I inherited. One of the curved windows at the bay. Soooooooooo gorgeous. Images like this leave me awestruck. THIS is mine? Golly. 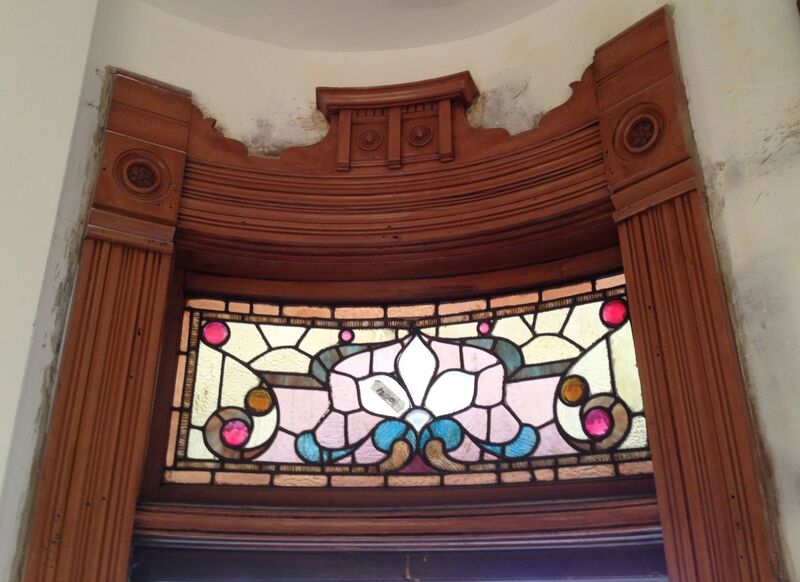 In the image, I have stripped the dark finish surrounding the stained-glass window. I love how much better the stained-glass looks NOT surrounded by a DARK finish (compare the image with the one above). And this is what Mr. And Mrs. Cross would have known. 19 Responses to What Mr. and Mrs. Cross Would Have Known. I know nothing about restoration, or really old homes for that matter, but I find myself visiting your page almost daily to see if you have posted a new update. I’m sort of mesmerized by the whole thing. The undertaking of the obscene amount of work, and the beauty that lies beneath all of the dirt and grime, sweat and tears. The story this house must hold, and if walls could talk to explain what life it has seen and lived — Wow! We get to sort of experience bits and pieces of said story through your restoration/blog process and its kind of magical. This house is really beautiful. Thank you for doing what you do, the restoring and the blogging for all of us to enjoy. Thank you for the lovely, kind words. Your thoughts are really touching, and it is a bit of a thrill to know that the Cross House Adventures are of interest to people. I love that you, and others, take the time to comment! I am always kinda amazed, too! Looks fantastic!!!! All of your tedious work is paying off! The “real” color is breath taking! Thanks Grace, Lesley, Betsy, and Cynthia! It is funny but this whole past year I never once gave any thought to the very dark color of the interior trim. It Just Was, and there were a zillion other important things to worry about. But the adventure of discovering the original 1894 faux wood finish has been quite exciting, and the difference in the living room is incredible. Even the guys working on the house told me today: this room looks so much better! And it does! It is much lighter, and feels contemporary all of a sudden (as opposed to very old fashioned). This is interesting as the revealed finish is without question the 1894 finish! Who knew that the 1890s could be so hip in 2015? Ross,I too check everyday to see if there is an update. I love the trim, it is beautiful, so glad it hasn’t been ruined. It is like discovering treasure. …discovering treasure. That is just how I feel, too! Hi Ross, with the exquisite woodwork restored, the stained glass sparkles like jewels. I have followed your comments on OHD. I’m curious as to what happened to the house at 901 Market St.? I thought it looked like a fairy cottage. 901 Market was sold, and is being used for storage. The house looks WAY worse than it did a year ago. It breaks my heart. OH Ross, that breaks my heart too!! I could just see this enchanted cottage with an English garden. Tears. Oh this is an AWESOME discovery – beautiful! That original color is soooo beautiful. What you found is what you call serendipity. Wow. Just makes you wonder and wait what else this house is hiding. Almost like a Cinderella story. She has been working hard all these years, fulfilling all kinds of duties that all required of her. But you are her fairy godfather waving your magic wand and bringing back all her original beauty; albeit, forever. P.S. I know a late post on this topic. But found you out and been reading every post consecutive order. Wish I were there. A late comment is just fine! While I can’t tell you how the faux finish was done, I can hazard a guess that the finish is supposed to be tiger eye maple. While not popular now, it has fallen in and out of favor over the years…and is hugely expensive! Most pieces one sees is furniture, carefully grain matched. To see the finish reproduced as woodwork would have been the height of luxury. I have an 1820’s rope bed made of Tiger Maple and our c1978 home has several door casings and door stops made of this stunning wood. You can feel the curly grain with your fingers. The odd thing is that the fine grain maple was installed in the formal rooms at the front of the house and the highly figured wood was put in two bathrooms and two bedrooms. Welcome to the obsession, Rick! I found out about Tiger’s Eye Maple about the time your home was built. That was the period that the ranch style home was in full swing, one that I do not appreciate. It is rather odd that your figured maple is in the rear of the home rather than at the front. I would think that the original owner had a limited amount of it and wanted to show it off in the private areas. Thankfully, yours hasn’t been painted over! Do yourself a favor in your reading…at least start reading the very first posts to see what Ross has had to contend with in his journey, it’s fascinating.